Autoblog touts the Chevrolet Cruze as the first small car GM has taken seriously. The Cruze looks well designed on the outside and the interior also stands out. 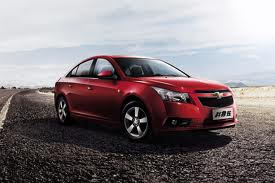 Though classified as an economy car the Cruze comes well equipped and has options that compete with larger sedans. Gas mileage is also a plus, the 1.4 liter 4 cylinder direct injected engine is pushing for 40 mpg. If you are in the market for a new commuter car with the options for upgrade, the Chevrolet Cruze looks like an appealing option. Cruze High MPG is Simple! A Clean Chevrolet Chevelle SS! Has Anyone Seen This Truck? Spy Shots of Convertible Camaro! 2011 Subaru Impreza WRX STI Sedan Back Again! Free Full Car Detail Giveaway! Subaru is Here to Save You From Office Monotony! This Subaru WRX STI Sounds Nasty! Roy Robinson is a Chevrolet, Subaru, and RV dealership located in Marysville, WA. We write about all things auto and Northwest. © 2018 fusionZONE Automotive, Inc.